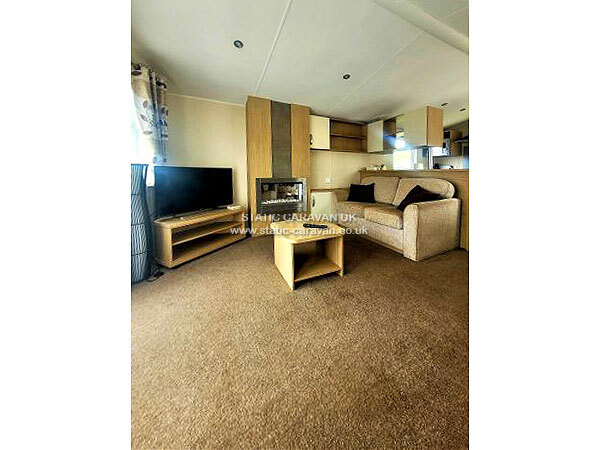 A fully equipped and well maintained Willerby Brockenhurst 2016 model 2 bed caravan which sleeps 4 comfortably and 6 with the use of the Sofa bed in the lounge. Available for holiday lets between March and November. Superbly located, this spacious holiday home overlooks both the cliffs at Burton Bradstock and the English Channel from the large secure south facing verandah which can be directly accessed via French windows from the lounge. It has a separate gate leading from it via steps and a further external gate that leads directly onto the path that either leads straight down a short bank to the grassy playing field that borders the River Bride or a 100m walk further along to the beach. The playing field is ideal for general play/ball games/flying kites. Ideal for access via local paths to Burton Bradstock and cliff walking. The beach is privately owned by Freshwater Beach Caravan Park and is a very relaxed affair - a relatively quiet spot even during high season where the owners go to great trouble to create a secure rockpool swimming area for young children in the River Bride simply by shifting the fine shingle around which is ideal. It is also dog friendly but owners are required to keep dogs on a lead at all times and clean up after them. It is a very popular spot for BBQs and fishing with the mackerel season being particularly popular in August. Sunsets are amazing and we recommend taking a couple of sunchairs down to the shoreline with a bottle of wine to sit and watch the sun go down. The main access to the holiday home is via a couple of steps at the side entrance onto the large veranda. There is a small storage box adjacent the front door which can be used for shoes/boots etc when coming in from a muddy walk or sandy beach. The plot has a large gravelled area which can comfortably fit 2 cars with one to the side of the caravan and one at the rear. Also situated in the lower gravelled area are two storage boxes - one containing a washing machine and tumble dryer equipped to take a bigger than average load, and a further storage box containing cushions for sunbeds, BBQ materials, buckets and spades etc. There is also a separate patio area on the lower level adjacent the decking incorporating a small pond and flower bed which when not being used as a further sunbathing space has provision for the use of the rotary washing line. 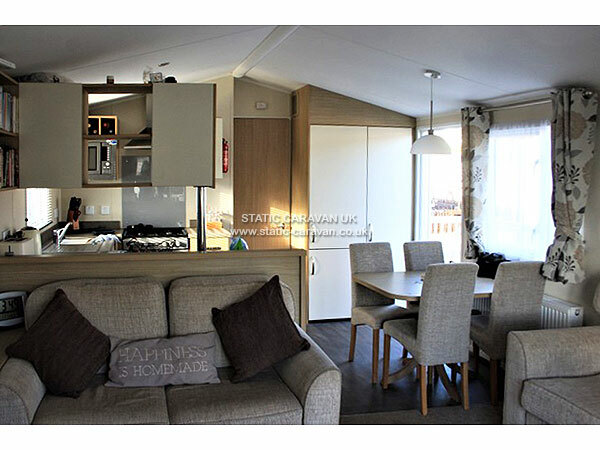 There is storage under the caravan but this is for owner access only. 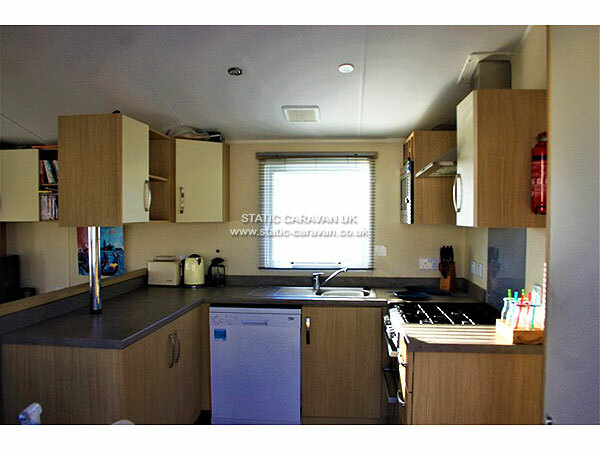 The caravan itself has a fully equipped kitchen with oven, hob, microwave, fridge-freezer and full sized dishwasher as well as a full complement of toaster, kettle, cafetiere, pots/pans, crockery, cutlery, glassware for up to 6 people. There is a dining area which will seat 4 people comfortably and a further storage cupboard incorporating a hoover, ironing board, coat hooks, broom. 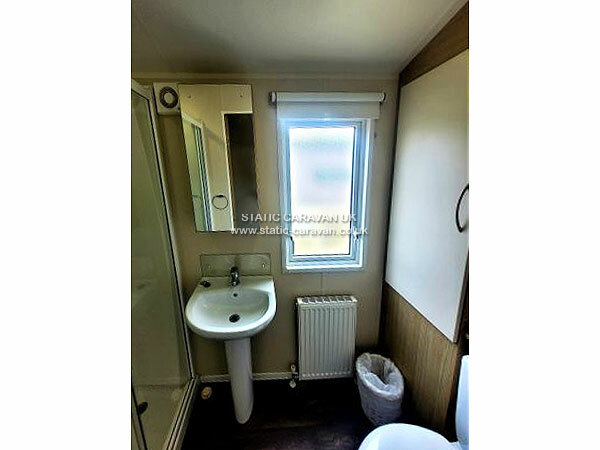 The master bedroom has an ensuite toilet, a full size wardrobe with shelving/drawer units contained within plus overhead storage, bedside tables and lights plus dressing table with mirror. The twin room is equipped with a wardrobe with drawers under plus overhead storage. Duvets and Pillows are supplied but you will need to bring your own Linen and Towels including Beach Towels. The family shower room has a good sized shower with good power and a toilet. Pets are welcome (max 2 pets). Dog bowls will be provided. A non refundable deposit of £100 per stay is required by BACS to reserve your dates when booking our holiday home. Full holiday payment is due and payable by you via BACS not less than 6 weeks in advance of your arrival. To avoid any disappointment, please ensure your balance has reached us by the given time. It is your responsibility to pay the full holiday payment within the time scale. A further security deposit payment of £100 is required as a damage/loss/cleaning payment and will be refunded to you by BACS payment as soon as our holiday home has been inspected after your departure. 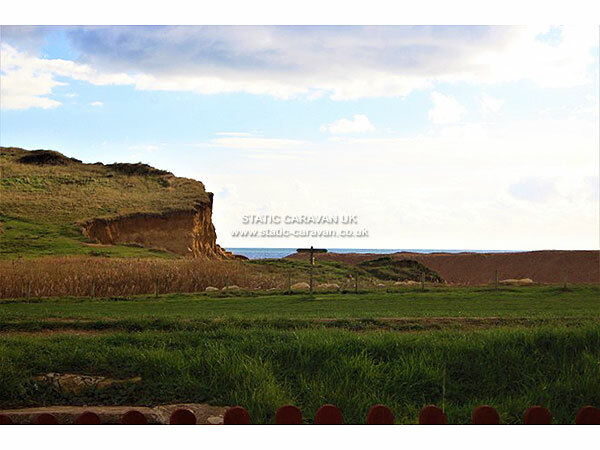 "A spectacular expanse of Dorset Beach enclosed by impressive clay and sandstone cliffs and gentle grassy slopes. A private haven for families and children - for sun worshippers, swimmers, wind-surfers, walkers and sea fishermen". 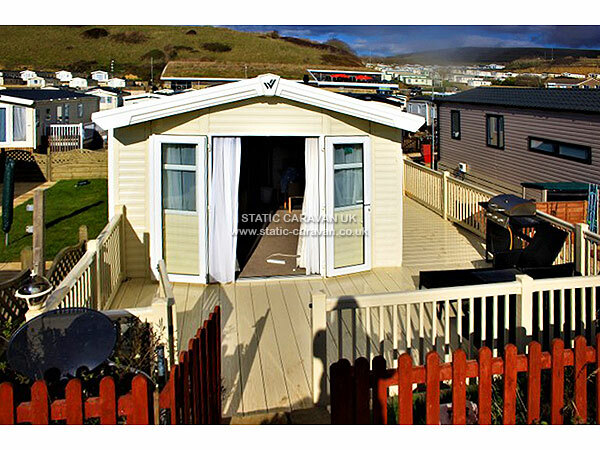 Freshwater Beach Holiday Park is located in the South West of England in the beautiful county of Dorset. Spend a wonderful seaside vacation on the coast, making the most of the private beach. There is also a Golf Course (not part of the park itself, but adjoining the site). 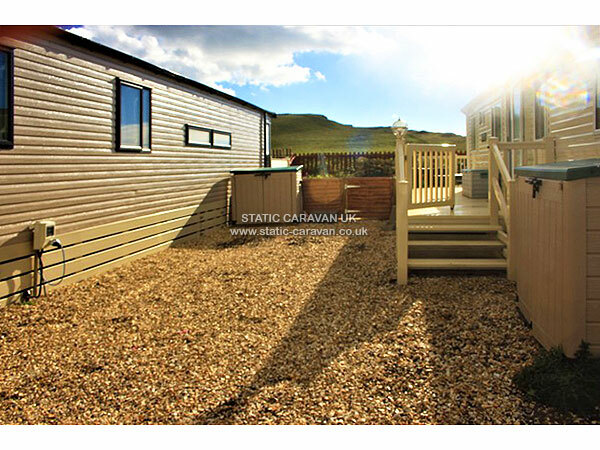 You can hire caravan holiday homes or pitch your tent, tourer or motorhome in our camping fields.